BayPort Credit Union is sponsoring a new synchronized music and light show beginning December 1, entitled 25 Nights of Northern Lights. City Center at Oyster Point is being transformed into the North Pole, offering visitors a five minute, theatrical Holiday Magic Light Show at the top of each hour, 6–10 p.m., with a 42-foot color-changing tree and a show of lights dancing around the fountain to a festive soundtrack. City Center restaurant patios will become “Jingle and Mingle” lounges with food and beverage specials. Windows throughout the venue will be filled with holiday displays. The city will host three themed North Pole Nights on December 1, 8 and 15, 5–8 p.m. with entertainment, free activities and food vendors. Each of the North Pole Nights will feature Santa’s Workshop, sponsored by City Center at Oyster Point, where children can meet Mr. and Mrs. Claus and see elves at work. Guests may also take a short trolley ride on North Pole Nights to the new Holiday Inn for photo ops in the lobby with a beautifully decorated sleigh and special gifts for kids and adults. Admission is free and free parking is available in the three City Center garages. Event updates will be posted on Twitter @nnfestivals, Instagram nnspecialevents and Facebook www.facebook.com/NewportNewsFestivals. For more information, call 926-1400 or visit www.nnva.gov/parks. Tiffany M. Boyle, Newport News Commissioner of the Revenue, has been recognized by the Commissioners of the Revenue of Virginia with the organization’s President’s Award at its annual conference in September. 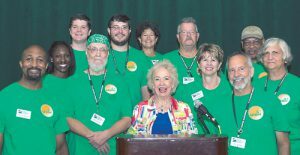 Boyle’s administration has been cited for its commitment to training opportunities, regional meetings as well as initiating the first annual Commissioners and Cans Food Drive, a fundraiser in partnership with several other commissioners of the revenue throughout the Virginia Peninsula. ECPI University has been ranked number one in the nation by Military Times in its annual Best for Vets survey, the most comprehensive school-by-school assessment of veteran and military student services and rates of academic achievement, as well as a detailed review of public data collected by federal agencies. More than 500 colleges took part in this year’s survey, with ECPI University ranking number one in the nation among career and technical colleges, a category that includes community colleges and four-year career-focused colleges and universities. Bill Brown is ECPI University’s executive director. Howard Hanna Real Estate Services held its ribbon-cutting ceremony in October for its Peninsula office located at 724 Thimble Shoals Boulevard. Participating are (left to right) Dennis Cestra Jr., vice president of the Southeast Region of Howard Hanna Real Estate Services; David H. Jenkins, Newport News councilman; Helen Hanna Casey, CEO of Howard Hanna Real Estate Services; Gail Coleman, president of the Southeast Region of Howard Hanna Real Estate Services; Bob Mckenna, president/CEO of the Virginia Peninsula Chamber of Commerce; and Howard W. “Hoddy” Hanna III, chairman of Hanna Holdings, Inc. Among the eight newest hires to the growing team of SOLitude Lake Management® is April Hall, a procurement specialist based in the Newport News office. Hall focuses on streamlining processes between sales, vendors and field staff to provide services to clients more efficiently. She has more than 25 years of experience in customer service, purchasing, inventory, human resources, payroll and bookkeeping. Mariya Furtah and Logan Bissell have joined the Newport News office of Malvin, Riggins & Company, P.C. Furtah is a senior associate and is responsible for expanding the firm’s audit and attestation department, working primarily on all phases of audit engagements. She will also assist with accounting, compliance and financial statement preparation. Bissell joins the firm as an associate, where his work will include accounting, compliance, financial statement preparation and special projects for a variety of clients. December events scheduled by the Virginia Peninsula Chamber of Commerce include Annual Meeting and Distinguished Citizen Presentation, December 4; Coffee Connection, December 5; and Business Connection After Hours, December 13. For registration and additional information, go to www.virginiapeninsulachamber.com/events/calendar/2018-12-01. Michael “Mike” Manicone has joined Movement Mortgage as senior mortgage loan officer. Manicone was formerly senior loan officer with Union Mortgage Group. Brandon Wilson has joined Liz Moore & Associates as director of media. This new position was created to leverage Wilson’s talent and experience and support multimedia initiatives. Wilson has served top national new homebuilders and leading real estate firms across the region. In this position, Wilson will serve all three offices of Liz Moore & Associates by developing and managing strategic media projects. Downtown Hampton Child Development Center (DHCDC) and VersAbility Resources are the recipients of the third annual “Big Give” sponsored by Impact 100, a group of 250 women of the Greater Peninsula. According to Heather Livingston, DHCDC executive director, the $50,000 grant presented to DHCDC allows the opening of a toddler classroom. DHCDC offers high-quality preschool to all Peninsula families. VersAbility Resources executive director Kasia Grezelkowski is using the $50,000 grant for a pre-employment training program to help students with disabilities to age out of high school with the support of family, transition professionals, teachers and employers. VersAbility supports 1,600 people of all ages in leading productive and fulfilling lives. Two $5,000 grants were also awarded to Alternatives and Thrive. The Diabetes Prevention Program of TPMG Nutrition Services has received full recognition from the Centers for Disease Control and Prevention (CDC). This recognition signifies the quality of the TPMG program and designates that all standards have been met for full CDC recognition. TPMG Diabetes Prevention Program (DPP), in partnership with the CDC National DPP, ensures participants can receive support and education to lower their risk of developing Diabetes. Cathy Bray, BSN, RN, CDE, is TPMG DPP facilitator and a Certified Lifestyle Coach. Brian Skinner, former president of TowneBank’s Peninsula/Williamsburg, has assumed new responsibilities as chief banking officer. Susan Harris has been named TowneBank’s Peninsula president. 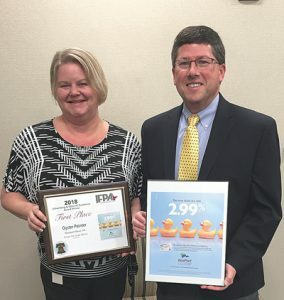 Bayport Credit Union was recognized at the 2018 Independent Free Papers of America annual competition with a first-place honor for a single color advertisement-large space. Accepting the award and copy of the winning ad are Bayport’s Tiffany Waersch, marketing specialist, and Jim Mears, senior vice president and chief operating officer. Personal Touch Home Care of Virginia, Inc. has leased 9,270 square feet of office at 11817 Canon Boulevard. Jungle Gym Strength & Conditioning, LLC has leased 6,664 square feet at 727 Blue Crab Road. Michael Shapiro, director of commercial sales and leasing with Drucker & Falk, represented the tenants in both transactions. Katie Donatucci, Chip Tiffany, Jace Harris, Steve Enoch and Tim Brown, REALTORS®, have joined Abbitt Realty Company as new agents, all of whom will be handling residential sales. Leanne Crist has joined Mortgage Network Inc, as a loan officer in its Newport News, Virginia branch. Crist will help area residents reach their home-buying or refinancing goals. 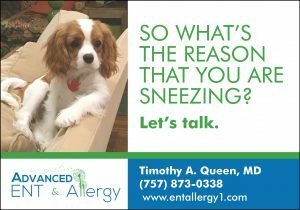 Crist serves clients throughout Virginia and specializes in the Hampton Roads area. She has 21 years of mortgage experience, serving homeowners across the country, most recently as a mortgage loan officer at Wells Fargo Home Mortgage. 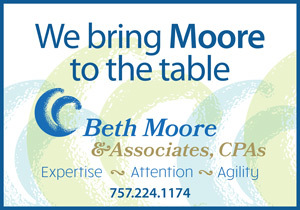 She is a graduate of Christopher Newport University with a Bachelor of Science degree in business administration. Riverside Health System received a federal grant of nearly $1 million to enhance dementia care across the region. Under the terms of the “Enhancing Family-Centered Approaches to Dementia Care Through Wellness and Training” grant, Riverside will expand on its current programs and partner with nationally recognized organizations to launch new programs in the region that will provide an ability to assess more older adults for dementia, give patients expanded access to physical wellness programs to help enhance their quality of life, and train the family and professional caregivers who provide the majority of support for patients as their disease progresses. The $999,032 grant was awarded to Riverside through the Alzheimer’s disease Programs Initiative. Riverside was one of 22 awardees nationwide that received a total of $20,400,542. Rick Jackson is executive director at Riverside Center for Excellence in Aging and Lifelong Health. Lisa Cafferty has been appointed vice president and regional sales manager at Old Point Mortgage. She holds her Bachelor’s degree from Virginia Commonwealth University and has more than 20 years of lending experience and extensive knowledge of the mortgage process. The current exhibition of Peninsula Fine Arts Center (PFAC), ADORN, will run until January 6, 2019. Open to the public, this exhibition series examines how a community enhances beauty and status. Through luxury handbags and high-end fashion, adornment is used to embellish, enhance or distinguish the individual within the community. The exhibition features Judith Leiber bags, Roberto Coin jewelry, special occasion gowns, fashion photography, fashion influenced sculpture, paintings and shoes. Top October agents for CENTURY 21 Nachman Realty’s Peninsula Office were Chris Pray, top listing agent; Donna Bösze, top selling agent and top producing agent; and Carol Sobieski, top closing agent. Renee Figurelle has joined Virginia Peninsula Foodbank as chief operating officer. Figurelle formerly served Foodbank of Southeastern Virginia as chief operating officer for more than nine years. In her position with Virginia Peninsula Foodbank, she oversees a team of staff members who work in the warehouse, transportation, agency services and food procurement. Prior to her work at the food banks, Figurelle worked for 20 years at the American Red Cross of Southeastern Virginia with her last position as regional chapter business development officer.